Fig. 1. Oscillation of the conduction band electrons resulting in the SPR effect in certain metal NPs such as Au NPs. Biophotonics is an area of research concerned with the development of novel optical techniques for applications in biology and medicine including the study of molecules, cells and tissue systems. It combines biology and physics (and sometimes chemistry!) to achieve this goal . Our work is focused on the development of a Terahertz imaging and temperature sensing technique that can be used for cancer diagnostics and hyperthermia therapeutic applications. The pillars of this research include the synthesis and photothermal characterization of gold nanoparticles, capable of heating following irradiation with light. It also focuses on heating processes in gold nanomaterials, particularly collective heating effects. In combination with Terahertz radiation, our aim is to develop an imaging technique that can also address a significant challenge in biological and medical applications, namely temperature measurements at the cellular level. Fig. 2. 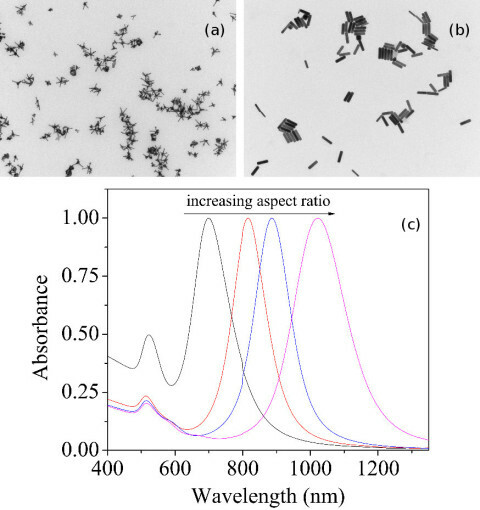 Synthesis of colloidal and water dispersible (a) gold nanostars, (b) gold nanorods, (c) Absorption spectra of gold nanorods with a surface plasmon resonance maxima from 0.7-1.2 μm. Change in the band position can be modulated via changing the experimental parameters of the synthesis technique. Our interest in gold nanoparticles lies in the fact that they are capable of confining resonant photons, in response to excitation with a specific wavelength of light that induces an oscillation of the conduction band electrons – known as surface plasmon resonance (SPR) (Fig. 1). The strongly absorbed light is followed by a rapid dephasing of the coherent electron motion in tandem with a rapid energy transfer to the lattice resulting in an elevation of temperature otherwise known as the photothermal effect or plasmonic heating . The plasmonic heating behavior of gold nanoparticles is greatly (and effectively) modified whenever they are located in a collective ensemble, resulting in a significant increase in their heating capabilities. Theoretical modeling and simulation along with experimental studies have shown that in this case, the additive heat fluxes of the individual particles are responsible for this nontrivial enhancement effect. Moreover, optically-driven gold nanoparticles will interact through plasmon-enhanced electric fields where each single nanoparticle ‘feels’ the field induced by the others. The resultant heat generation depends on the inter-NP distance and arrangement [3, 4]. We synthesize gold nanoparticles in various morphologies including rods, spheres, or stars (Fig. 2) in the size range of 2-200 nm, relying on the use of surfactants such as CTAB or Triton-X 100. Our synthesis allows us to tune the morphology and size of the particles. This in turn allows us to modulate their optical and photothermal properties. 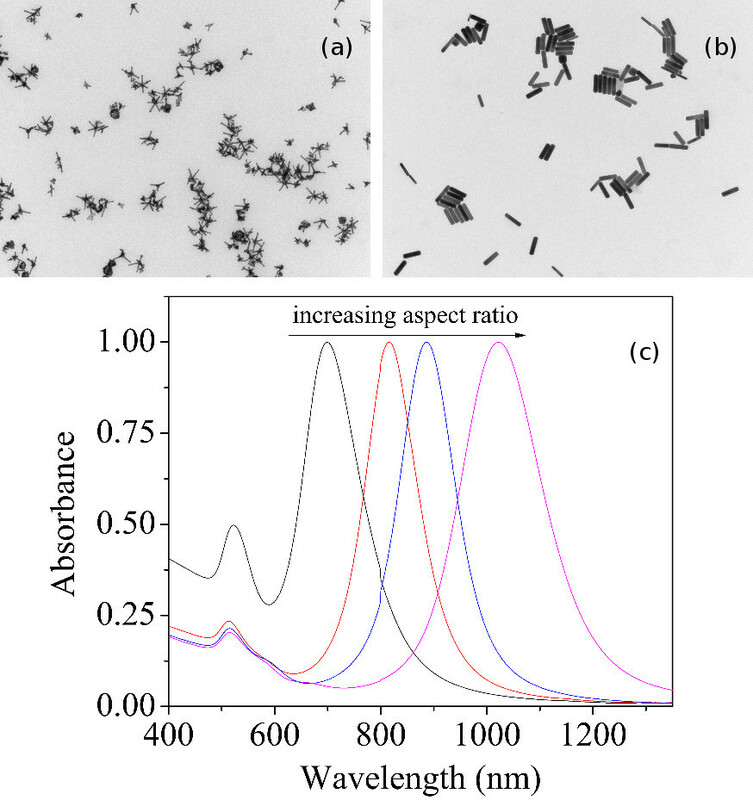 For example, controlling the size and aspect ratio of gold nanorods allows us to shift the plasmon resonance band from the far red and into the near-infrared region of the spectrum. A moisture map of a drying leaf obtained by raster THz scanning was the first demonstration of THz imaging and was followed by other examples of moisture detection . The inherently central role of water in numerous basic biological processes renders THz imaging a promising technique in medical applications. For example, imaging of skin cancer and burn wounds has been extensively studied , where variations in the dielectric properties of tissues are observed due to changes in hydration levels . In our research, we exploit the changes to water content in tissue systems, as a function of temperature, and the effect on Terahertz radiation in order to develop a concomitant imaging and temperature sensing technique. Injection of colloidal GNRs in a skin model is used to demonstrate that plasmonic heating to 45 ºC is achievable at very low power densities of 17 W/cm2 (Fig. 3). Relating the changes in the Terahertz reflections to a calibration curve we establish over the biologically-relevant temperature range of 25-60 oC, allows us to extract temperature information and adds a Terahertz thermometry arm to our research. Fig. 3. THz reflection signal intensity in the mapped skin sample (following GNR injection)and plasmonic heating at (a) 0 W/cm2, (b) 17 W/cm2 and (c) subtraction of (b) and (a). Axis on the right reflects intensity scale. Relating the changes in the Terahertz reflections to a calibration curve we establish over the biologically-relevant temperature range of 25-60 ºC allows us to extract temperature information and adds a Terahertz thermometry arm to our research. SPIE (2015). “Gabriel Popescu plenary talk: Bridging Molecular and Cellular Biology with Optics”. SPIE Newsroom. doi:10.1117/2.3201503.18. J. H. Park, G. von Maltzahn, M. J. Xu, V. Fogal, V. R. Kotamraju, E. Ruoslahti, S. N. Bhatia, M. J. Sailor “Cooperative nanomaterial system to sensitize, target, and treat tumors” P. Natl. Acad. Sci. USA 107, 981-986 (2010). A. O. Govorov, and H. H. Richardson “Generating Heat with Metal Nanoparticles” Nano Today 2, 30-38 (2007). H. H. Richardson, M. T. Carlson, P. J. Tandler, P. Hernandez, and A. O. Govorov “Experimental and Theoretical Studies of Light-to-Heat Conversion and Collective Heating Effects in Metal Nanoparticle Solutions” Nano Letters 9, 1139-1146 (2009). D. M. Mittleman, S. Hunsche, L. Boivin, and M. C. Nuss “T-ray tomography” Optics letters 22, 904-906 (1997). Tewari, C. P. Kealey, D. B. Bennett, N. Bajwa, K. S. Barnett, et al. “In Vivo Terahertz Imaging of Rat Skin Burns” Journal of biomedical optics 17, 0405031-0405033 (2012). J. Y. Suen, P. Tewari, Z. D. Taylor, W. S. Grundfest, H. Lee, et al. “Towards Medical Terahertz Sensing of Skin Hydration” Studies in Health Technology and Informatics 142, 364-368 (2009).